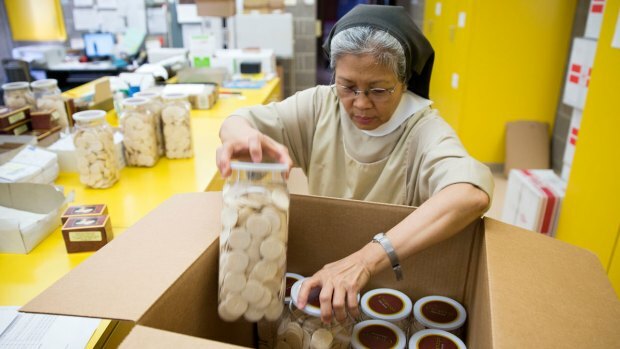 A group of cloistered nuns has been working overtime in the kitchen to help Philadelphia church officials prepare for Pope Francis' visit, baking 100,000 communion hosts for his public Mass. Religious sisters at the suburban Monastery of St. Clare put in extra shifts for about two months to fill the order, which represents a portion of the wafers that will be offered at the outdoor service on Sept. 27. Up to 1.5 million pilgrims are expected to attend. "We're very excited," said Sister Anne Bartol. "It is a very special work for us, and we take very good care — extra care — with how we make them." As an enclosed community, the Roman Catholic nuns known as Poor Clares don't leave the monastery except for medical reasons. They support themselves financially in part by making hosts, also called altar breads, for about 200 customers across the U.S. and Canada. The three-hour baking sessions begin around 8:30 a.m. Flour and water are mixed into batter, which is then poured onto a griddle embossed with religious iconography. It bakes for a couple of minutes, emerging as a flat sheet stamped with designs. After spending time in a humidifier to add moisture — otherwise the bread will shatter when cut — the sheets are placed in a machine that punches out dozens of disc-shaped wafers. The hosts are later inspected, counted, bagged, packaged and sent. Sisters usually make about 125,000 wafers per month using their immaculate and affectionately nicknamed ovens Raphael, Maddalena, Vincent and Benny. (The humidifiers are Archangel and El Rey.) A bag of 500 small hosts costs about $5, plus shipping and handling. It seems fitting the Poor Clares, an order founded more than 800 years ago, would be asked to help with the pontiff's visit. St. Clare was the first female follower of St. Francis of Assisi, the namesake of Pope Francis. Though some nuns dedicate their lives to active ministry and charity work, Poor Clares lead what is known as the contemplative life. The 13 sisters who reside at the monastery in Langhorne, about 20 miles northeast of Philadelphia, devote themselves to prayer. Sister Jean Therese Rossignol entered the community two decades ago after having "always felt the desire to become a religious sister." She had previously worked in the business office of a Maine newspaper and later looked into life as a missionary in Africa. While there, she felt called to return to the U.S. to live a contemplative life. Yet the Poor Clares aren't entirely secluded. They conduct business via email, maintain a website, and allow the public to visit their chapel. And the sisters say the Philadelphia archbishop has given them a temporary reprieve from their vow of enclosure, permitting them to attend the Mass where their bread will spiritually nourish the faithful. "We're very much looking forward to being there, to seeing (Pope Francis) in person, and to being together with everyone," Rossignol said.